I've been a big fan of Megan McArdle's work for years, in no small part because I frequently find myself agreeing with her. She's libertarian but not dogmatically so, she's generally thoughtful and careful about whatever she writes - heck, she even used to work in small business IT support like I did. Consequently, I suppose it's no big surprise that, once I finally set some time aside to read her book, that, surprise!, I frequently found myself agreeing with her. However, the reason I'm writing what amounts to a rather informal and tardy book review is because, deep down, I really want you to read her book and maybe, just maybe, agree with her too. If that doesn't happen, don't panic - I'd settle for you reading her book and then explaining in graphic detail why I'm horribly wrong and hopelessly misguided. I wouldn't mind having a little more of that in my life anyway. But first, in order for that to happen, I need to convince you to read her book. So let's get started. To begin with, the book isn't particularly long - in eBook form, it's less than 160 pages. In terms of total reading time, it took maybe 4-6 hours, give or take; I didn't keep a stopwatch on me while reading it, but it took me less than a week of occasional 5-30 minute stretches to get through it, if that helps. So, the opportunity cost sacrificed by reading this book is really quite minimal. That's not doing it? All right, let's talk about what this book is about. 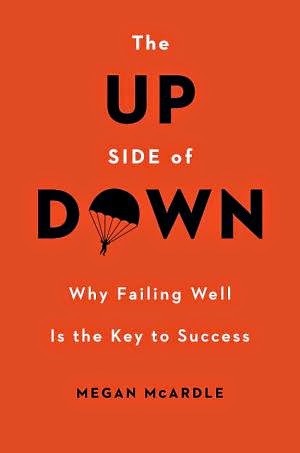 The crux of the book, and of quite a bit of Megan's previous blog posts, is about how we as a society deal with failure and why it's important to not only deal with failure but allow it to continue. It starts with the results of a simple experiment - how tall of a structure can you make using spaghetti noodles? It turns out the people that do the best at the experiment aren't structural engineers, though they do quite well - it's kindergartners. Why? Well, it turns out small children will try just about everything, including asking for more spaghetti (nobody said you couldn't) or just piling a bunch of spaghetti up into some sort of starchy Ziggurat. However, in the process of blindly trying everything, they initially fail, oftentimes spectacularly. No problem, though - they don't care because, hey, they're playing with spaghetti - so they brush themselves off from whatever imaginary psychic slight they should experience from failing to build something with starch worms made from durum wheat and try something else. Then something else. Then something else. Until they eventually get something built. I’ve spent most of this book talking about risk and redemption. I’ve exhorted you to eschew blame and understand failure as the natural consequence of risk and complexity. I’ve asked you to do your best to recognize when you’re on the wrong track and to focus on fresh starts rather than retribution. But sometimes people do things that are not just risky, but wrong. Sometimes people deliberately break the rules that society has set up to protect itself. Some of those things are directly harmful to others, like theft and assault. Others, like skirting food safety regulations, create an unacceptable risk to fellow citizens. People who break the rules do not just need a fresh start. They need to be punished. But not too much. The economists Anna Aizer and Joseph Doyle recently investigated what happens to juvenile offenders who are sent to prison, compared with those who commit the same sorts of crimes but are put under less harsh forms of supervision. The juveniles who went to of costs associated with investigating, arresting, convicting, and imprisoning them. So how do we punish people in a way that doesn’t ensure they emerge from the experience ten times worse? Successful people have what psychologists call “self-efficacy” or an “internal locus of control”: they feel that outcomes mostly depend on what they do. People who believe that they can control their fate are more likely to have happy futures even if they’re wrong about the extent of their control. A person who believes he can grow up to be president is probably incorrect, statistically speaking. But the person who believes he can’t is never wrong. The solution is to instill a locus of control, to show that it's possible to make meaningful changes to one's life through personal choice, by creating a probation system that renders immediate, sensible consequences for choices. If someone on probation in the HOPE system does something, they will be swiftly punished, but not excessively so. If good choices are made, punishment is avoided or minimized. If poor choices are made, punishment is swift and escalates. This is actually a pretty profound concept for a lot of people currently stuck in the corrections system, in no small part because they were never raised to see a connection between cause and effect. In a lot of households, rules are sporadically enforced at best, and when they are enforced, they are often done so capriciously and violently. Children raised in that sort of environment don't learn that actions have consequences - instead, they learn that authority is something random, unpredictable and should be feared, like an earthquake or a volcano. This lesson, or the alarming lack thereof, is then reinforced by our random and capricious probation system, which allows those on probation to get away with missed appointments, failed drug tests, or the inability to maintain employment... until, one day, for no apparent reason, it suddenly doesn't. Then, the person on probation suddenly finds themselves locked in jail for 10 years. It should go without saying that people raised in that sort of environment are going to fare rather poorly in a traditional educational system. This gives me an opportunity to take this book review - seriously, read the book! - into a sharp turn to explore something else. As I've discussed a couple of times previously, I work for a for-profit vocational school, and things are a little different here than a traditional university. The most immediately obvious difference relates to how we deal with classroom attendance. At the university I went to, the general attitude was, "Well, you're all adults - show up or don't, do the homework or don't, we don't really care, but don't expect to do well if you don't bother to participate." Where I work, however, it's very different - first, instructors actually have to take roll. If a student misses more than two days of class, the instructor has to fill out a sheet and counsel the student on their attendance. If a student misses more than a week's worth of class in a phase, they're placed on academic probation. If they fail academic probation - fail to maintain a sufficiently high GPA and keep their absences to a minimum in the next phase - they're potentially kicked out of the school. Our students are adults, right? Who cares? Well, our students are adults, and many of them have excellent internal locuses of control that help them make positive choices, but that doesn't mean all of our students do. The ones that don't are a problem - if we pass them through provided they don't defecate on the final, turn in an occasional homework assignment, and maybe show up to a lecture or two (I got through a couple of classes in college doing not much more than this), there's a strong chance they'll take the same work habits they used in school into the workplace. Considering the stellar reputation already enjoyed by for-profit vocational schools in the employment market, we simply can't afford that kind of a black eye, not if we actually want any of our students to get gainful employment and pay the occasional student loan back. There are also moral and ethical issues involved as well in charging students five figures for a credential instead of an education - those, I'm sure, would be what my boss would much rather I focus on in this paragraph instead of the craven self-interest of student debt repayment. There's a reason I'm responsible for our IT and not, say, the Admissions Department. So, for several really good reasons, we have to instill locuses of control into students that might not have them. For us, this means lots of strict, consistent, small punishments that more or less mirror what they'll experience in an idealized workplace. This means swiftly catching people that show up two minutes late for class, swiftly marking them as tardy, consistently counseling them on showing up on time, counting tardies as absences if it happens often enough, and then putting them on the micro-punishment path of the attendance policy if the behavior continues. It means swiftly catching people that aren't turning in their homework or not putting much effort into it, swiftly grading it (within 24 hours, more often than not), and quickly counseling them at any point where their grade gets below passing, even if it's the middle of the second week of class. It means driving home the point that actions have consequences. At the same time, however, my employer also follows Megan's advice (more or less) and lets students fail - but not permanently. If a student fails out of one of our public universities here, nobody's making phone calls or even acknowledging that the student failed - financial aid will stop cutting checks, the student won't be able to enroll in their classes, and, suddenly, they become a non-person, pretty much just like that. Failure is permanent, or challenging enough to reverse where it might as well be. If a student fails academic probation or fails some classes at my work, however, it's not the end of the world - not only are they welcomed back, we actually call them and ask them to come back. Then we walk them through which classes they can retake without getting hit with a financial aid penalty, we walk them through getting their GPA and attendance back up, and we get them back into the program. They suffer the sting of a six week leave of absence - just enough to let them know that, yes, they made a serious of unfortunate choices - but then it's done and it's time to forgive and forget. This still isn't enough for every student, but for each student it is enough for, it's one more student that completed college, picked up a marketable skill, and is now living a little bit better because of it. I bring all of this up not because I'm looking to cheer on my employer. I bring it up because this book helped me understand a pattern in my employer's behavior that, to be honest, I suspect might have manifested itself as much as a response to market conditions as anything else. Whatever the motivation, it turns out we're on the right track, and thanks to reading The Up Side of Down, I can now explain why to any unfortunate soul silly enough to ask me about it. Seriously, read this book. I'm not going to promise you'll pick up an epiphany or two as well, but... you never know.